More than 3,000 years ago the sophisticated Maya culture emerged from the humid rain forests, flourished for centuries, and then vanished. In that time, the they created a complex writing system, devised a calendar equivalent to our own, introduced the concept of zero in mathematics, predicted lunar and solar eclipses, and built the tallest structures in the Western Hemisphere—all while Paris was just a sleepy village. Yaxhá was a ceremonial center and city of pre-Columbian Maya civilization. 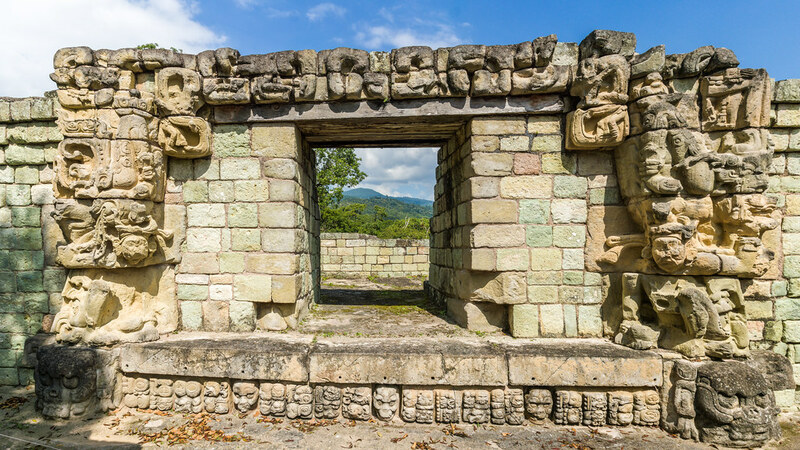 Lamanai was once a major city of the Maya civilization, located in the north of Belize. Tikal is one of the largest archaeological sites and urban centers of pre-Columbian Maya civilization. Guatemala City is the capital and largest city of Guatemala, and the most populous in Central America. Panajachel is situated on the northeast shore of Lake Atitlán which might be considered the cradle of Maya theology. Antigua Guatemala is famous for its well-preserved Spanish Baroque-influenced architecture as well as a number of ruins of colonial churches. It sits just to the north and east of three volcanos that dominate the skyline. In San Salvador we visited Boquerón Park, which is situated atop one of the peaks of San Salvador Volcano. We had a good view into the caldera and surrounding areas. Joya de Cerén was discovered by accident in 1976 by a bulldozer driver leveling ground for a government agricultural project. Copán, Honduras, was the capital city of a major Classic period Maya kingdom from the 5th to 9th centuries AD.